(ABN 21 001 352 969) is an Australian company trading in coins, medals, stamps, banknotes and related material. Annually the company conducts three major, international numismatic auctions. All auction enquiries are welcomed and free to the public. Noble Numismatics also trades retail in a variety of numismatic material and offers immediate settlements to purchase all types of collections. Arrangements for valuations can be made by contacting either Sydney (02) 9223 4578 or Melbourne (03) 9600 0244. 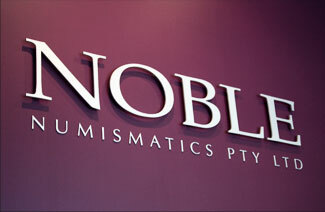 Noble Numismatics is a registered member of the IAPN, the world-leading association of numismatists. The association's international members include renowned firms from around the world. "The members of the IAPN guarantee the authenticity of all the coins and medals which they sell - this is a condition of membership"
"Membership is not lightly acquired and the vetting of applications involves a protracted procedure"
"In order to be admitted... the committee needs to be satisfied they have carried on their business in an honourable manner and that they have a good general knowledge"